Revolutionary acts: Henry Gleaden on Nadia Fall’s alarmingly current-feeling first show as AD at Theatre Royal Stratford East. In 1476, the downtrodden people of a Spanish village, Fuenteovejuna, rise up and kill the Commander who has been mistreating them. Around a hundred and fifty years later, sometime between 1612 and 1614 (historians aren’t exactly sure, but they’ve narrowed it down considerately, so give them a break guys) the playwright Lope de Vega takes this story and writes a play which speaks to the political conditions of his time. 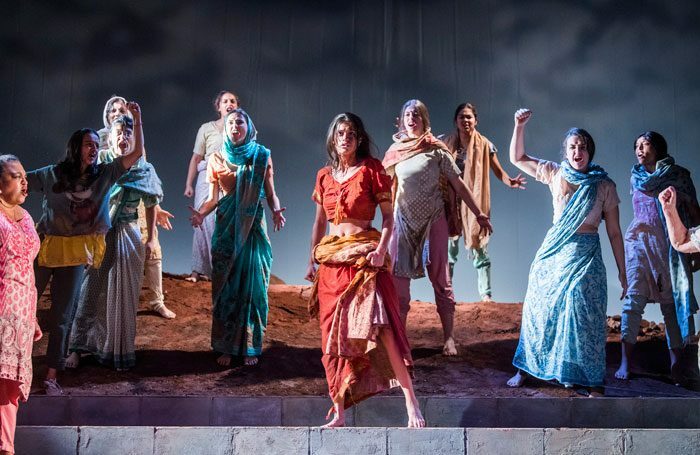 Now, in 2018 (historians are pretty sure of this one) in The Village, April De Angelis has adapted that play and set it in contemporary India, finding plenty of alarming modern parallels to centuries-old figures and events. The villain of de Vega’s piece, a Commander serving the Order of Calatrava (a real military order formed as an offensive against Muslim power in 1164) has become Gangwar, Inspector of the Indian Police and a proud member of the BJP (a real right-wing political party, whose policies have historically reflected Hindu-nationalist positions). From the opening scenes, which confidently invoke the holy trinity of hard-to-get-right modern references, the Trump, the Brexit and the Alternative Facts, it’s clear that this is a production determined to show us the relevance of this now over five-thousand-year-old story of collective action against corruption. The setting has become Sahaspur, a multi-cultural village where Hindus and Muslims live and work together peacefully. Jyoti (Anya Chalotra) and her friend Panna (Rina Fatania) are debating an issue which has surely troubled us all: dudes or food? Meanwhile said dudes, Farooq (Scott Karim) and Mango (Ameet Chana) attempt to educate and impress with their studied insights into the way the world works, or as Jyoti puts it ‘a dose of blokes explaining’. This interaction, while playfully establishing the flirty romance between Jyoti, a Hindu, and Farooq, a Muslim, also subtly introduces a recurring theme of the piece; left unchecked, men will thoughtlessly impress their values on women, forever. Left unchecked, men will act upon those values at the expense of women, forever. De Angelis writes in verse, with efficient language that keeps a steady rhythm. This lends the characters a kind of hyper-articulacy which is used to great comedic effect when withering putdowns are quickly dispatched or the rhythm is suddenly broken by those who are less bright. However sometimes when the actors are speaking it can feel as if they are working towards the resolution of a rhyme, rather than attempting to make an impact on one another. Director Nadia Fall quickly establishes a bold style of performance that isn’t quite direct address but certainly feels as if the audience are included (and implicit) in everything that is said and done. For better or for worse, this almost pantomimic quality is hard to shake off in a scene which depicts an act of sexual violence. The set, a brutalist concrete arch, becomes an oppressive, ever-present frame for the action, so that even in the moments of joy, when Jyoti sings beautifully or the community comes together for a wedding full of colour and dance, there is a sense of foreboding. Inspector Gangwar (Art Malik) emerges from behind a hill of mud and dust and the Imperial March plays in your head. He’s all-villain, all the time, but this feels right for what he represents; there’s no empathising with extremists here. When the women of Sahaspur rise up against his abuse, the stage is bathed in red and the ensemble flood the stage in a chaotic rush of movement and light. It’s a dangerous, last-ditch intervention, a moment of change propelling them forward into the unknown. This moment, you’ll find it in 1476 when a mistreated village in Andalusia rises up, you’ll find it in 1613ish (historians, get your act together) when de Lope takes the story of that village and makes it more, makes it myth, and you’ll find it in 2018, when in the inaugural production of her first season as AD of Stratford East, Nadia Fall presents us with a necessary act of revolution. The Village is on at Theatre Royal Stratford East until 6th October. More info here.